Year Three at the SEAS (Space Education and Action School) Space Agent Program and Adelaide Banks has made it to agent-in-training! Addie, aka Space Girl, has graduated from Space Cadet and Captain, and has now made it into the last year at SEAS Space Agent Program. Students must complete a number of dangerous and important missions to outer space planets that need help, and need to earn more than 100 mission points in total to earn the rank of Space Agent. But nothing is easy in the mission to become a Space Agent. In Book 13, Space Agent Star Girl is called away from her preparations for the Agents’ Masquerade Ball by an urgent mission text message on her Spaceberry. The Planet Catlabrator is turning into muddy sludge and the alien creatures keep getting bogged! 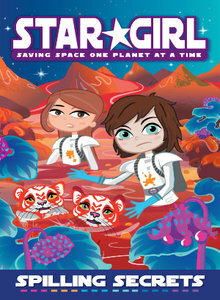 Star Girl and her fellow agents-in-training, Space Agents Supernova 1 and Asteroid, must save the puppy-like aliens with the tiger faces (known as catralabs) from drowning. Space Agents Star Girl and Supernova 1 are focused on the task at hand but is Space Agent Asteroid? After discovering a certain Space Agent received an invitation to the Agents’ Masquerade Ball from the handsome Space Surfer, she is more focused on thwarting Star Girl’s chances of attending the ball than saving the catralabs. Whether Star Girl can save the catralabs, overcome the evil actions of Asteroid and still make it to the ball is uncertain until the final pages of the action-packed Star Girl 13 Spilling Secrets. In Book 16, it is graduation week but Space Agent Star Girl hasn’t flown a mission since her harrowing trip to Planet Oceanella and still does not have enough mission points to graduate with her best friends. But when Space Agents Comet XS, Neuron Star and Shooting Star are called to an important mission to the Planet Molluscara, they have more on their mind than just rescuing the alien shelluscas. 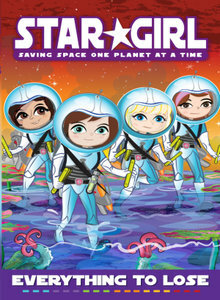 With the help of her very best friends, Star Girl braves one last mission in an attempt to not only rescue the shelluscas from deadly fire and smoke but to earn the vital mission points necessary for graduation. The Star Girl series is an exciting and empowering series which touches on skills necessary to succeed in any mission (real life or fantasy! ): trust, quick thinking and the ability to work as team. The action-packed books combine the trials and tribulations of everyday life in a boarding school with the dangerous and action-packed adventures of the best space fantasy and will appeal to girls aged 7-10. Readers can also check out the Star Girl website: http://www.stargirluniverse.com/.